We sat around at the North Fitzroy Arms about a month ago and decided that it would be inappropriate to have two Malarkey books competing against each other for major honours. So we’ve published The Doggies Almanac now, in 2016. And we’ll be publishing The Footy Almanac 2016 in March, 2017. Writers, you’ll hear more from us in the next weeks. Readers, stay tuned. Perc, you’re going to have to bless the season and the book. Read more about The Doggies Almanac. Come to the launch of The Doggies Almanac. Once again congratulations on Doggies’ second flag! It was the massive and memorable year for the entire footy world, I reckon. I understand the reason why the regular Footy Almanac will be published in March next year and respect your decision. I hope to be contacted by you guys soon for article(s) to be published. By the way, what would happen with Footy Almanac 2016 if the Bulldogs didn’t win the premiership thus year? It’s a good question you ask. 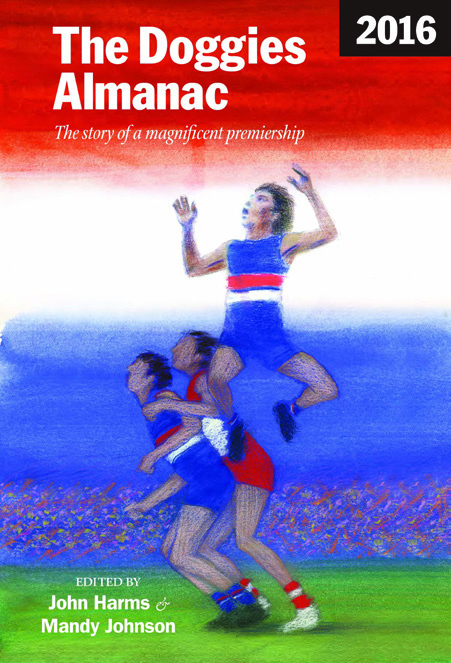 The decision to do a one-club Almanac was a response to a whiole range of circumstances not the least of which was the great celebration from most of the footy community for the Dogs. I think people loved the Doggies story. When the writing on our site was so heartfelt – people like Dean Lusher, Kerrie Soraghan, Neil Anderson, Alex Docherty and so on – and so engaging, I thought it deserved to be collected in an anthology. If it had been Hawthorn we would have dissolved the company. But more than likely we would have stuck with tradition had it been Geelong, Hawthorn, Sydney. A GWS premiership would have made things interesting. One of our editors K. Carroll has always argued the case for a one-team Almanac. (He would – he’s a Hawthorn supporter). And a couple of experienced people from publishing (Chris Ryan is one of them) have thought the Almanac should be a pre-season release. We’ve always thought it was the ideal Christmas gift! And we have always wanted to include as many writers as possible. The Doggies Almanac includes 37 writers. The Footy Almanac will include around 160 – of you are one Yoshi. Writers can expect to hear more in the next weeks. Whatever happens we will continue to celebrate the writing of fans, and the game itself. I think that the Doggies Almanac is a great idea. I wonder Harmsy if the Western Bulldogs football club would put it in their merchandise store or sell it on their club website as what a great memorabilia piece it would be for any Doggies fan. In fact what an opportunity for any team that wins the premiership in a particular year to ask someone like the Almanac to put together their own premiership winning teams alamanac each year from now on (of course some financial backing from the club to put the publication together would be needed). I would love to have three Lions almanacs on my bookshelf in 2001 – 2003 that has a written piece on every game that year the Lions played written by your everyday supporter. Also great to hear there will be a Footy Almanac for 2016. I was going to send you a picture of my two boys disappointed faces when I told them there may not be an Almanac this year due to the publication of the Doggies Almanac. They look forward to the Footy Almanac every year and I can’t wait to tell them the good news. Thanks for your comment back. I sense how big the Bulldogs’ second premiership is and it’s good to honour the club and their supporters. Dean, Kerrie, Neil and Alex have great passions to support the red, white and blue. And I believe winning the flag became reality thanks to their passionate. I’m sure the Doggies Almanac is an ideal Christmas present for footy lovers as their stories are so inspiring and everyone loves the stories. Well done the Footy Almanac! I think Andrew’s idea of including the Almanac in the Bulldog shop is a great idea if it can be done. At the moment, Bulldog supporters like myself spot anything red, white and blue coloured such as book covers and we reach for our credit cards as a reflex action. I am about to do a sale’s pitch in book-shops in Warrnambool and Hamilton using the front cover picture of the Almanac about to be published. It should be a best seller in Hamilton where Liam and Billy hail from. I would expect J.T.H would appreciate any other recruits who can spread the word about the Almanac in country areas. If there is one thing I have learned this year, its that nothing stays the same. I loved the concept of the Doggies Almanac. And if you’re wondering about Christmas presents why not purchase a 2017 Almanac membership for family and friends? Then they can get the Almanac at a discount when it comes out in March!! I’ve put in an application to have Christmas moved to March23. Great idea re Almanac memberships for Christmas. A membership means a FREE copy of the Almanac. The economics of book publishing and distribution are daunting. It costs me nearly as much to mail a book from Perth to my dad in Adelaide as it does to buy it. I prefer to read hard copy books and magazines but price pushes me toward digital on IPad or Kindle. And it doesn’t weigh a ton in my bag. So congrats to JTH and the Malarkey crew for keeping the hard copy book alive – one edition at a time. Hard to see that a cold hard economic case could be made for all the other clubs. Perhaps the idea of the Premiership Club or a wealthy benefactor underwriting the fixed costs of production? eg St Kilda – the Fox bequest or the Wroby Inheritance Money? I must admit to some initial scepticism upon learning about the Doggies Almanac. But my thinking became: why not try something different given that the Dogs’ premiership was so different. If there were a Footy Almanac version of Glengarry Glen Ross, say Glenferrie Glen! Archer, we’d all be in strife if Rulebook was a competing salesperson. Looking forward to both the Doggy and the traditional Almanacs. Well done to JTH and the team. JTH – Members get a 2016 Almanac FREE!!! So non-Members, member up!! The target should be 10,000 free Almanacs given away next March. And at the Almanac we don’t mind the concept of branch staking – have as many fictional members as you want. Just so long as you pay for them. PB, don’t forget the poor, downtrodden Navy Blues. Salt of the earth. Good working class folk who’ve suffered under tyranny (admittedly, their own) for so long. A heart rending tale sure to touch the nation. Bruce Doull could be the patron saint. He’s an Almanac kinda guy. Best seller guaranteed Would make Macbeth read like Beatrix Potter..
Bulldogs are certainly worthy beneficiaries of a special edition. Best thing to happen to footy since the Pies broke through in 1990. JB, 2057 Book looks a cert for the Blues. Let’s hope Harmsy’s grand-kids are empaths. More importantly: Does this mean Swanny is still a chance for the cover of the 2016 FA? Great news Harmsy, I’ll be convening a Christmas, part two, in March for the Oaten family. It’s a worthy idea. If my Footy Places sales are any guide to go by, ‘Footscray’ sits at number one. Typical response from Geelong mafia elites on this site. You can only ignore the rust-belt for so long. Has Donald taught you nothing? Just checking on the 2016 Almanac? Also wondering when the 2016 Almanac will be available please? HI Chrissy, the duck appears to be swimming across the water easily, but the legs are going at a million miles an hour underneath. We are almost finished The Footy Almanac 2016. We’re hoping to have it available by the end of the home and away season. Perhaps I should put up a post about it. Wondering if the 2016 AFL Almanac will be available for Xmas 2017 purchase please?